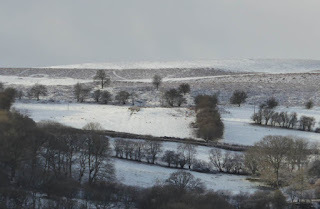 My snow theme continues from the last blog as we’ve had a considerable amount of snow in Mid-Wales in the last few days – about 12 to 15 inches and it is incredibly beautiful. Before the great snowfall, though we had a dusting of snow and it is this I will concentrate on now as it will hopefully give you new ideas and help hone observation skills. This is part of the view from my bedroom window, and may appear unremarkable. It does have a number of lessons for us, though. Starting from the top, you will see that on the left the white moorland top is caught white against a medium grey sky, but as the eye travels to the right this changes gradually as cloud shadow falls across the moor. At the far right the moor is now darker than the sky. This counterchange effect is extremely useful to add interest to our work, especially in the less exciting parts of the composition. Below that top band lies rough ground with dead vegetation. The dusting of snow has all but disappeared here but you can detect a slight warming of the colour. 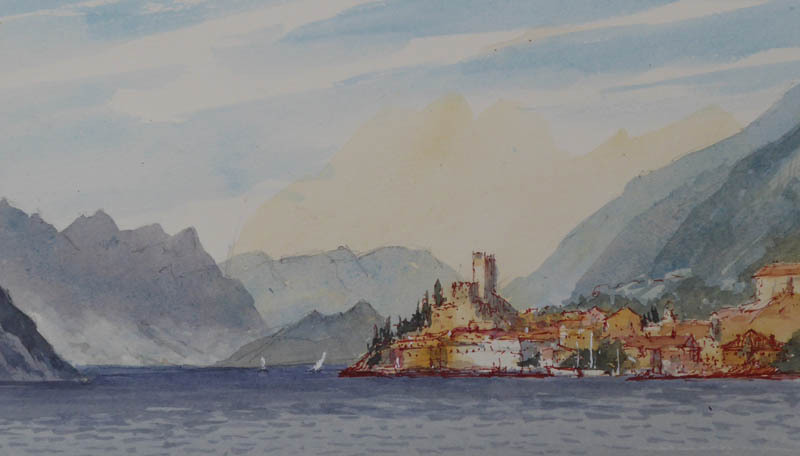 One way of achieving this in a watercolour is to rub a candle horizontally across the paper, then lay a wash which perhaps includes some light red to suggest the warm colour. Rough paper will accentuate this technique, and you can create the white pathways visible in places by combining this with masking fluid. Beneath the band of warmer, broken colour the snow lies on a smoother field and so is more continuous. Grey cast tree shadows fall across it in places and there is an occasional patch of rough ground here and there. As you are no doubt aware, snow does not always look a pristine white. Observe and analyse the scene before choosing your paper, methods and approach; alter your cloud shadows and move these various parts around to suit yourself. It’s great, creative fun, so enjoy it! 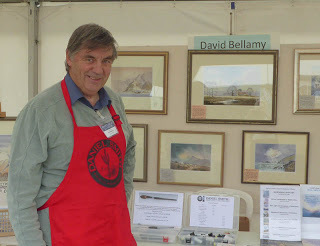 It was great to see so many familiar faces at Patchings Art Festival earlier this month, and exchange experiences with many of the artists and exhibitors. It’s a wonderful show that seems to get better every year, so if you’ve not been then put it in your diary for next July. As well as demonstrating the fabulous Waterford papers in the St Cuthberts marquee I had a stand next door. With just Jenny and myself on the stand we were run ragged and completely sold out of how-to-paint books by the third morning. We also ran out of some of the exciting Daniel Smith watercolour paints, despite an emergency deliver from DSHQ! We almost sold out of my new Arctic Light book as well. It’s had some tremendous reviews, with its wide range of subjects, including several painting techniques that I haven’t featured in books before. I particularly enjoyed creating the wildlife paintings, especially those where I spent quite some time with the animals, studying both their form and ways. 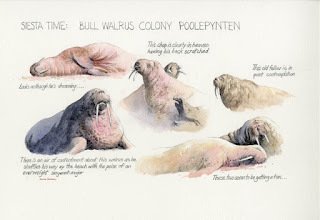 My favourite poseur was the walrus, generally an amiable fellow on land, especially when basking in the sunshine, though he can be rather vicious in the water if he takes a dislike to you! At a bull walrus colony on Svalbard I found these beasts in a great many fascinating poses – many more than shown here – and in order to feature as many of these as I could in the book I decided to render them as a montage on one large sheet of Saunders Waterford hot-pressed paper. This paper really enhances the detail in the walrus’s extremely textured hide. It’s really worth thinking about creating a montage where you wish to display a variety of actions or features in a scene, and perhaps add a little bit of humour at the same time. I also did a similar montage depicting the amazing actions of a single polar bear. Great fun! It is a sad fact that in many paintings skies are painted without much forethought, when in fact they should be considered as an intrinsic part of the composition. They not only set the mood and lighting effects, but clouds, sun, squalls, lightning and stormy effects can all be positioned and treated sympathetically in relation to the ground features, especially mountains, hills and trees with which the sky comes into contact. 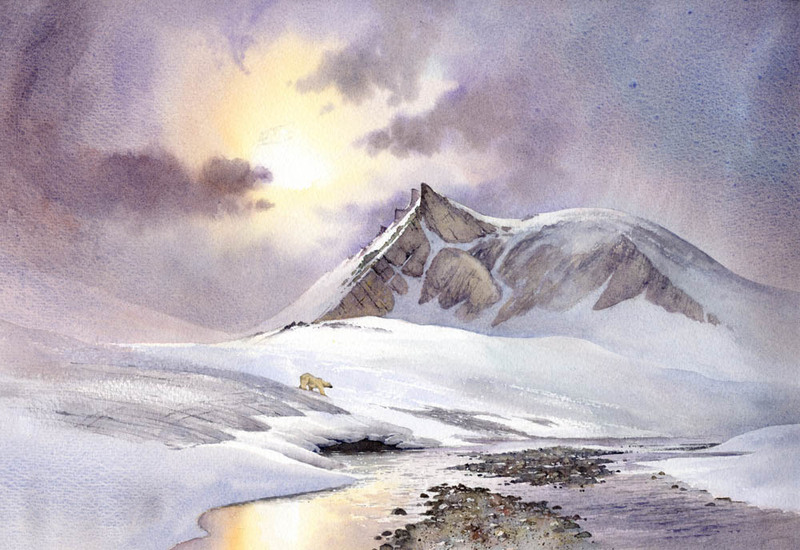 In this watercolour from my new book David Bellamy’s Arctic Light I have placed the most interesting part of the sky close to the summit of the Geologryggen peak and directly above the polar bear, thus bringing all the main elements together. For this painting, done on Saunders Waterford rough high white paper I began by wetting the whole sky area then working in quinacridone gold around the brightest point, and immediately blending in permanent orange to warm it up even more. I had already mixed up a wash of Moonglow with French ultramarine and applied this to the rest of the sky. While this was all still wet I brought in some much stronger Moonglow to apply the darker clouds wet-into-wet. Note the counterchange where mountain meets sky – the right-hand side shows the mountain slope dark against light, as is the rocky summit, but the rest reveals a sky darker than the snowy ridges. The paints I used here are the Daniel Smith watercolour range which have some amazingly gorgeous colours. So, when you are doing those thumbnail sketches to work out your composition, don’t forget to include the sky, unless it covers a small part of the work. For those who enjoy painting skies and really want some good examples the Arctic book is a real treasury as it is crammed with a whole variety of skies suitable whether you are painting in Bognor, Bornholm or wherever. For further details see my website.